While tooth decay is a potential problem at any age, the risk increases as you grow older. Not only are senior adults more susceptible, decay is often more difficult to treat. That’s because cavities can occur at or below the gum line, often due to gum recession. If that’s the case, we won’t be able to fill the cavity in the usual way because the gum tissue is in the way. 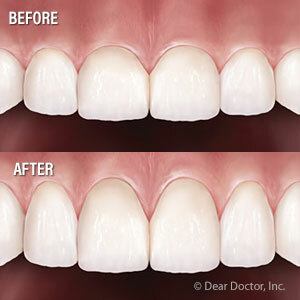 To make it possible to treat, we may need to perform a minor surgical procedure known as crown lengthening. As the name implies, the procedure helps expose more of the crown, the tooth’s visible part, from the surrounding gum tissue. In basic terms, we’re repositioning the gum tissue away from the biting surface of a tooth to make room for a filling. It’s also useful for improving a tooth’s appearance by making it look longer, or creating room for a crown or other dental restoration. After applying a local anesthesia, the dentist (or periodontist, a specialist in the gums) creates a tiny flap of gum tissue with a series of incisions. This allows the dentist to move the affected gums out of the way to access the underlying bone. The dentist then reshapes the bone to adequately support the gum tissue when it’s finally repositioned to expose the crown. In its new and improved position, the dentist sutures the gum tissue in place. For a few days afterward, the patient will need to restrict their diet to soft foods, avoid strenuous activities and apply an ice pack to help reduce swelling the day of surgery. They will also prescribe a pain reliever and possibly an antibiotic to reduce the chances of infection. While most people return to normal activities a few days later, you’ll usually have to wait a few weeks for the gums to heal before undergoing any further treatments for the affected teeth. But even with the wait, crown lengthening could make it possible to not only save your tooth but improve your smile as well.